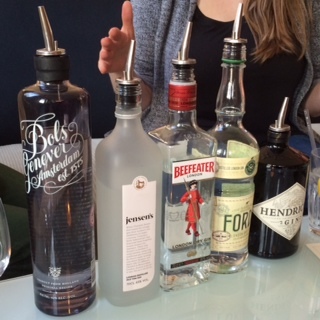 A Gin Tasting at Bourne & Hollingsworth Buildings – What’s your favourite type of gin? What’s you favourite gin? If that question has got you thinking isn’t gin just gin? you need a gin-tasting evening. Gin is enjoying a renaissance and to learn more I went along to the Guide to bluffing your way through gin course at Bourne & Hollingsworth Buildings. Led by Emma from GinMonkey who is an expert on all things ginny I left able to distinguish Old Tom from Genever and knowing never, ever to add lime to Beefeater London Dry. Bourne and Hollingsworth Buildings is a chic, mis-matched chairs, fashion magazines lying around, well-stocked bar type of place in EC1. It was the first sunny evening I remember and the large windows were open, looking across the road at the local park. Five neophytes gathered around the bottles, a flight of five gins facing us. Early gin history is necessarily hazy – anyone interested enough to write about it was too pickled to write about it – but we learned of its Dutch origins (gin is the original Dutch Courage) and its 18th century popularity relative to beer as it wasn’t taxed and anyone could make it. Though we were all scholars and intrigued by the Glorious Revolution’s part in London’s Gin Craze, we were really there for the gin. First up was Bols Genever, made according to an 1820 recipe. This Dutch gin is made from malted alcohol, giving it something of a toasted whisky-vibe. Jensen’s is an example of an Old Tom, popular in the 19th century. This type of gin was sweetened, originally to take away the appalling taste of the cheap, un-regulated gins prevalent at the time. For obvious reasons it’s the correct gin to use in a Tom Collins. London Dry was the first attempt to regulate gin making. The name is not geographically protected – unlike Champagne, Cornish pasties and, oddly, Plymouth gin – so your London gin could be made anywhere. But it had to reach certain standards. Beefeater with its citrus overtones is the classic example, and is actually still made in Kennington. Ford’s is the exciting new kid on the gin block. With the strapline It doesn’t take an empire to make a gin, it is designed in part for bartenders with a measuring scale down the bottle and a perfect balance for pouring. 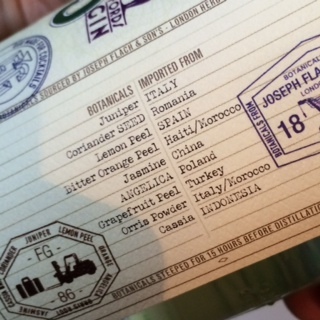 It also lists all the botanicals and where they come from on its label, so on a rainy Saturday you could try and make your own at home – except of course that is illegal. Finally we sipped the Hendricks, flavoured with cucumber and rose. More delicate flavours, but I was sold on the original Genever. Unusual and not what I would have expected from a gin, but the malted highlight was an enjoyable change. The only trouble is, with my new found knowledge I’ll never be able to order a simple G&T again. This gin tasting is part of a series of Guide to bluffing… events at Bourne & Hollingsworth Buildings, aimed at helping you stay on track with the latest trends. Other subjects have included wines and Irish tipples and during April and May will include the election, finding online stardom and the Cannes film festival.